Learn how to make your panels and presentations stand out in a senior HR job interview for all the right reasons. Advice from Simon Geere, head of Alexander Lloyd's Senior HR division at time of writing. How many times have you sat on a panel or listened to a presentation as part of the interview process to assess a potential employee? If you are from a larger corporation then the answer may be frequently. However, experiencing them as the interviewee rather than the interviewer is a different matter entirely. 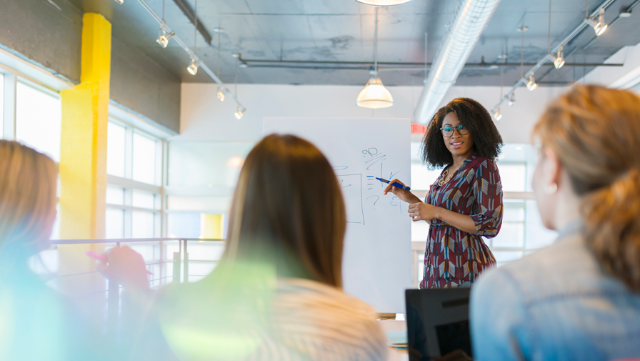 It can be much more daunting that the standard competency style format, as you have either additional interviewers throwing questions at you, or a presentation to deliver to an audience, or both. HR professionals need as much support when preparing for a panel interview or presentation as anyone else. Because panels are more unusual, and presentations are more demanding, it has been my experience that they can catch you off guard and the danger of a “rabbit in headlights” response becomes very real. In both scenarios you are under very close scrutiny and the pressure is heightened. Be it the challenge of dealing with a number of interviewers throwing questions at you, or speaking in front of an audience, it is certainly an experience out of your normal comfort zone. I have known one or two candidates in my time who have taken a more laid back attitude with minimal preparation for such circumstances that has come back to bite them – being blasé about this process will not win you points. The key point for a successful panel interview or presentation is preparation. While this is undeniably true for any interview, with these types of formats it’s essential. You don’t just have one or two interviewers to worry about, you may have upward of three, and a presentation to deliver. Firstly ensure that you have researched the background of each of your interviewers and their current position in the organisation. Your consultant is your first port of call, but social media is also a key part of that research. LinkedIn is the obvious choice, if they have a profile; do you have any connections in common, or is their profile public? If they hold a senior position with the organisation, it may be possible to glean information purely from Googling them, or checking the trade press. Look for commonalities between you. Have you perhaps worked for the same company previously, or do you have other links in common? Use this information to develop a rapport and if possible contextualise your answers and examples. Your presentation itself requires a great deal of preparation, and knowing who your audience is will aid you in deciding how to pitch it. Structure is crucial, one clear message running though the entire presentation will keep you on track, and cutting it down into sections that consist of an introduction, the development of your core message and summary or conclusion will keep it concise and punchy. Length – don’t get carried away with too many slides, you will lose your audience’s attention. Keep it concise and no more than ten to fifteen slides as a maximum. Content – PowerPoint is supposed to be a visual aid, not densely packed with information that you read out verbatim. A headline and three to four bullet points is ample, or a graph of diagram to support your argument and give you prompts work best. Presentation – consistent fonts, sizes and backgrounds lend a professional and polished look. Whizzy animations might showcase technical skill but they can be highly distracting for your audience. Keep them to a minimum for when you want to make an impact. During your panel interview or presentation, you are aiming to demonstrate your business acumen and showcase your understanding of how HR benefits the other area of business. Use every opportunity to do so and demonstrate how the HR function can add value to the business in a wider context. Traditionally viewed as a cost centre, this is your opportunity to highlight how the HR function can be a cost saver and improve operational efficiency, taking its place in the value chain. You need to emphasise in the interview what methods you have used to achieve this and the results achieved in previous situations. Opportunities to sell yourself will arise during the course of the interview; grab hold of these with both hands. This is not a question and answer session about HR – this is about you. Engaging the entire panel or audience is a challenge, but essential for success. Eye contact with the main questioner is vital, but don’t exclude the rest of your panel. If presenting, ensure that you sweep the entire audience as you speak; avoiding eye contact communicates your nerves very clearly to everyone. Body language must be open and engaged during the question and answer section and presentation. You might find that you prefer to stand whilst presenting, practicing on family members, friends or even your consultant who may be able to provide coaching will help you to find which style is preferable for you. Panel interviews and the question and answer section of the presentation formats can vary, dependant on the organisation. Sometimes a Chair will lead, and they will ask the majority of questions whilst others take notes and may chip in with a couple of questions at the end. Alternatively, each panel member may take ownership of a certain element and ask questions in turn. The most intimidating is the free for all, with little organisation or structure and all members of the panel jumping in and asking questions. This format is most likely to catch you off guard often with a good cop/bad cop approach. Much of the assessment protocol is about how you cope in a pressurised environment. In a panel, this pressure is generated through the dynamic of different personalities, creating a very challenging environment for the interviewee. In a presentation the pressure comes from the challenge of skilfully presenting your arguments to an audience of people, while keeping them engaged and interested. Despite their challenges, they both provide you with an opportunity to shine that you must take full advantage of for success.